The Cassini probe that is currently orbiting Saturn has recently sent some amazing images of the storm that has been raging at Saturn’s north pole for years (decades?, centuries?). 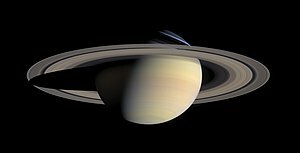 This entry was posted in Astronomy and tagged astronomy, Cassini, Cassini–Huygens, NASA, Saturn. Bookmark the permalink. Thanks for visiting my blog and taking the time to leave a comment. I am happy you find the information to be helpful.